Angels are a beautiful symbol with which to decorate your home, whether you are decorating for the holidays or creating permanent fixtures for various rooms. 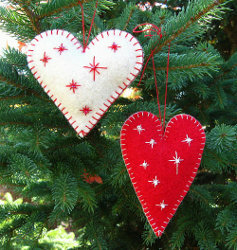 These cute heart shaped ornaments make wonderful gifts or gift wrap accents. Follow this tutorial for easy Christmas crafts or unique Valentine crafts that use recycled wool sweaters. See this project and more ornament sewing tutorials in 6 Sew Easy to Make Christmas Ornaments, a free eBook to download! If you love making ornaments out of felt, you can make these adorable Felt Christmas Tree Ornaments, too! Cut out hearts. To make a heart shaped paper pattern, fold a piece of paper and starting at the fold, cut out one side of the heart so that the fold is the center of the heart. This way when you open the paper you have a perfectly proportioned heart. Try several shapes and sizes until you have the desired heart shape. 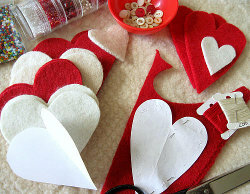 Then pin the paper to the wool and cut out two hearts for each ornament you want to make. I also cut out some smaller hearts to make contrasting centers for some of my ornaments. Embroider and embellish the hearts. I used a contrasting color embroidery thread to sew simple stitches in star and swirl patterns on some of my hearts. Then I stitched on seed beads as embellishments. 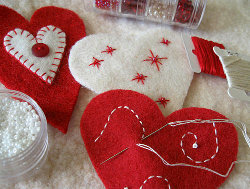 On other hearts I used a blanket stitch, or buttonhole stitch, to appliqué smaller hearts to the center, then added a button for embellishment. You will be using two pieces of wool for each heart ornament. You can decorate one or both sides of the ornament. Sew the hearts together. 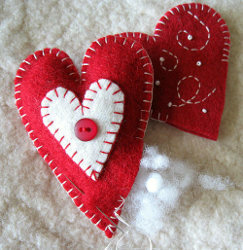 With wrong sides together, use a blanket stitch to sew around the outside edge of each heart. When about a one inch opening remains, fill the heart with stuffing, then finish stitching to close the opening. Hang the heart. Thread a short length of wool or cotton thread through the top edge of each heart to hang on your tree or tie to a package. I love working with felt because it is so forgiving! I do like wool felt, but I am allergic to wool, so I use the less expensive felt that is not wool. 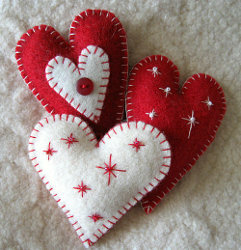 These heart ornaments could be used for ornaments or as gift package tie-ons to make your gifts really special. The heart shape is also great for Valentine's Day or any day when you want to express your love! This is good news. A sewing project I can actually do! I have lots of felt scraps, and I can hand stitch. Now if I can just remember some embroidery stitches from way back when I used to do embroidery. Really easy tutorial for heart ornaments will help me try this project correctly. I plan to make fabric ornaments as well. OMG! They are so cute and will make great addition to my Christmas tree this year. So perfect! Also, the same project can be for Valentine, Mother's day and other days when a gift is required. Of course, changing the snow decoration and replacing with something else. Also, it looks so easy and quick, I have to try it today.Thank you for the idea. I have some felt that I bought it while ago, will give a go to this project! These are sweet and very easy to do. And once you have the basic ideas down, you can branch out. Trace around cookie uterus of stockings, bells, stars and other holiday themes. Cut them out and finish just as you did these. Try different colors of felt. Green, gold, blue and so on. Thus is great. These are so cute and would make great gift-toppers for Valentine's Day! I can't wait to make these and also use it as a craft project with my grandchildren! They are going to love this! I like the idea for a pin cushion. What a grea,t simple craft for me for Christmas. I can make a set of 4 for gifts!! i love this one so much,i can't wait to make them for valentines day. Loved making these! Good way to use up left over felt or fabric too.